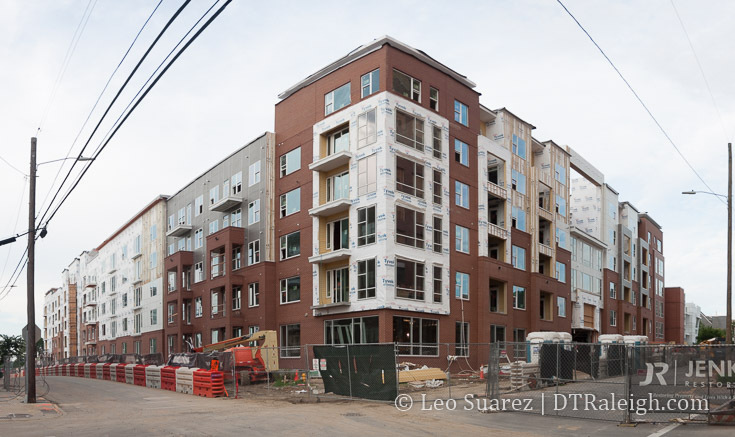 The Metropolitan apartments over in Glenwood South is nearing completion. Walking around the area, the new building has a nice mix of materials compared to similar developments. There are a few blank walls that aren’t that exciting but being near all the upcoming retail at Smokey Hollow, residents in this area will probably be thrilled with its location. 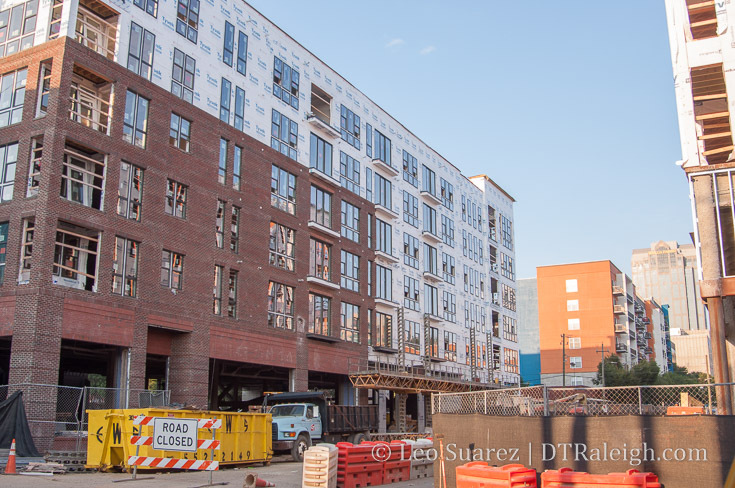 Leases are already being signed and new residents may move in at the start of 2019. Once Jones Street is open and neighbors have moved back into the Quorum Center, there will be huge reasons to celebrate here! Just a quick one today. 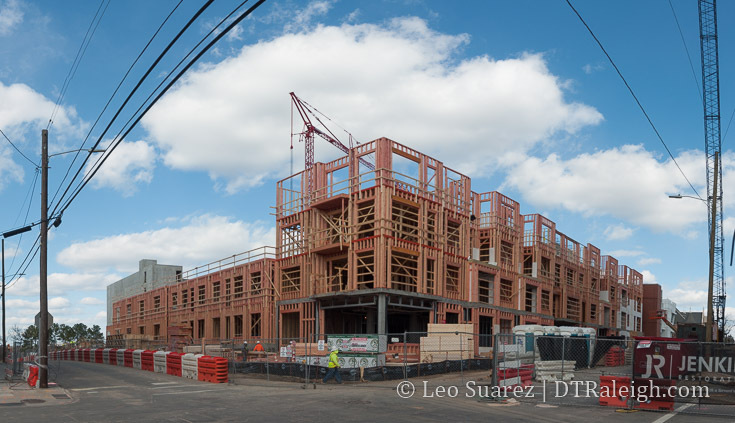 The Metropolitan apartments are starting to really take shape and are well past the point when they burned down in March 2017. It’s great to see the recovery and get these units online as it’ll make this area of West Street a very dense residential corridor. Continue the conversation about this project on the DTRaleigh Community. 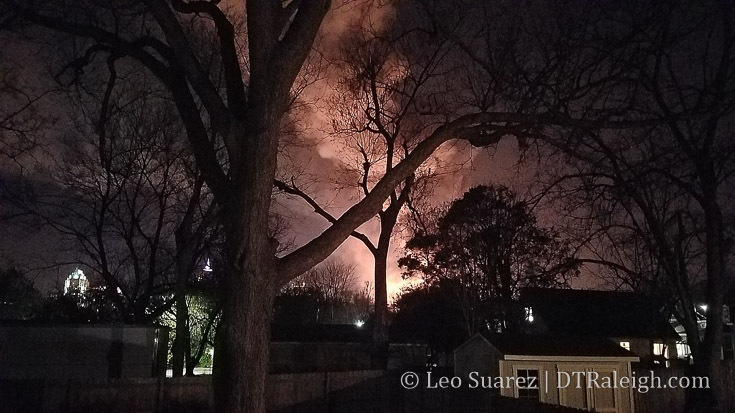 It has been a year since the 2017 fire and things are still not cleaned up on Jones Street. 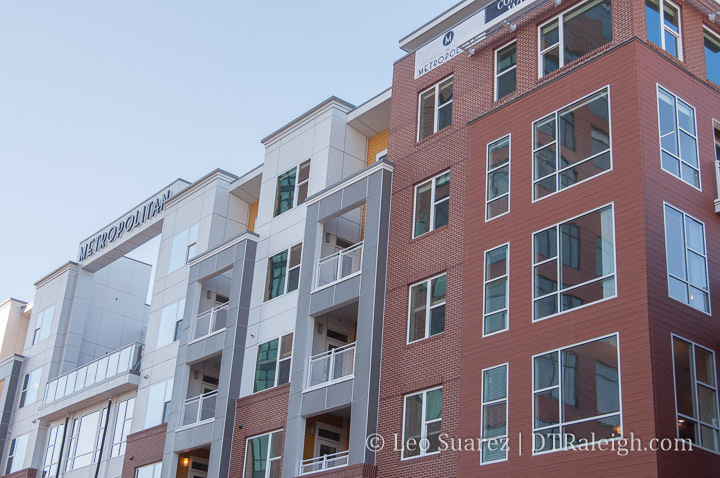 The Link apartments seem back to normal on the outside and West Street is now open. The Metropolitan, shown above, is rising up again but across the street, there’s still lots of work to be done. The Quorum Center seems to be slowly replacing the entire facade that faces Jones and new brickwork is underway. I can’t pretend to feel what those residents are going through still but I will toast it up tonight and hope that Spring 2018 brings leaves AND residents back to Jones Street. 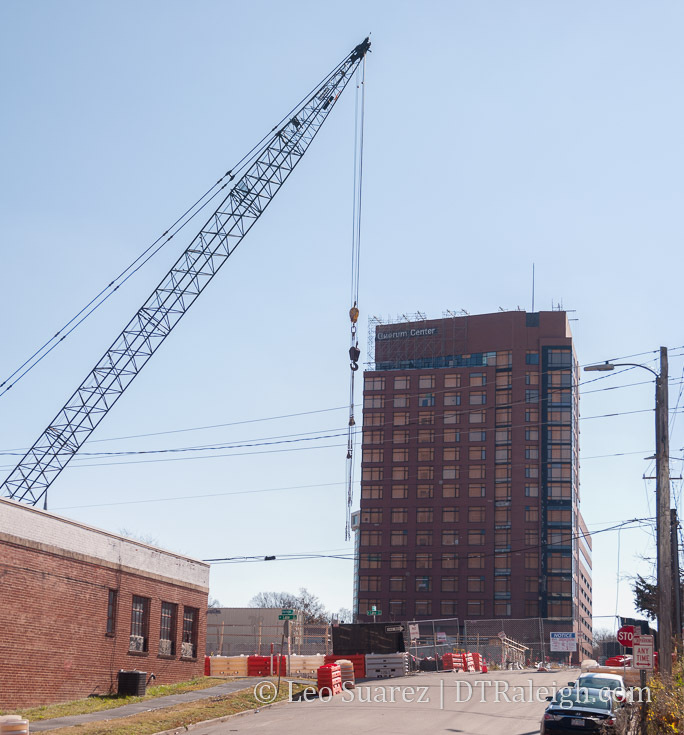 A crane has shown up at the site of The Metropolitan. The parking deck is being put together and foundation work has begun. It’s great to see the site being rebuilt after the fire in March of this year. The area nearby is undergoing a lot of change so it’s nice to see planned residential come through. Hopefully, the roads will reopen sometime soon. Feels doubtful though as the Quorum Center is still in pretty bad shape from what can be seen on the outside. 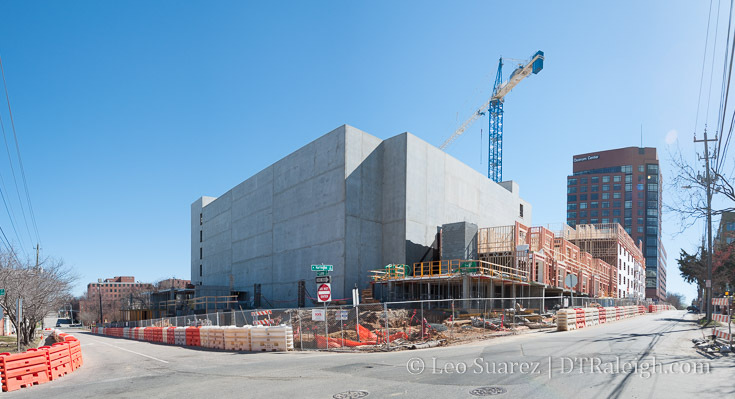 I present two wide shots of the currently under construction The Metropolitan Apartments. 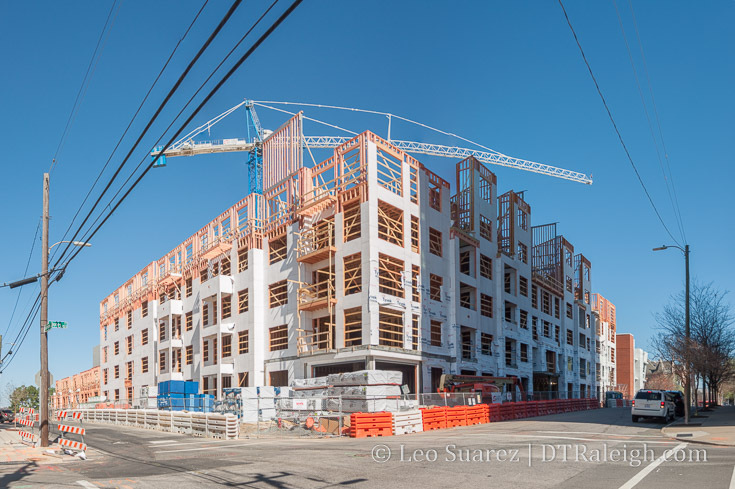 Judging by the height of the stairwells relative to the wood construction apartments, the building is almost topping out along Jones Street. There is still a lot of room for more units as you go down Harrington and turn around Lane Street. 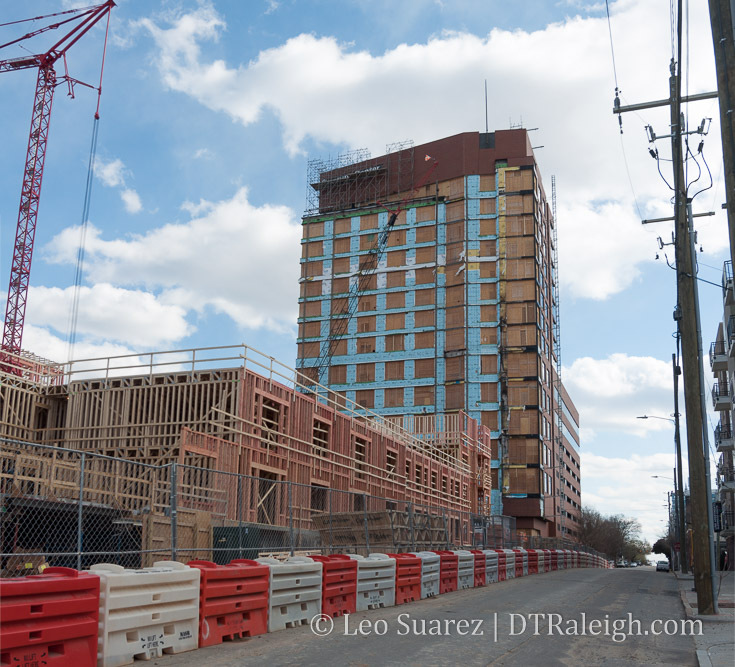 At this pace, the units along Jones could have residents moving in before the year’s end. 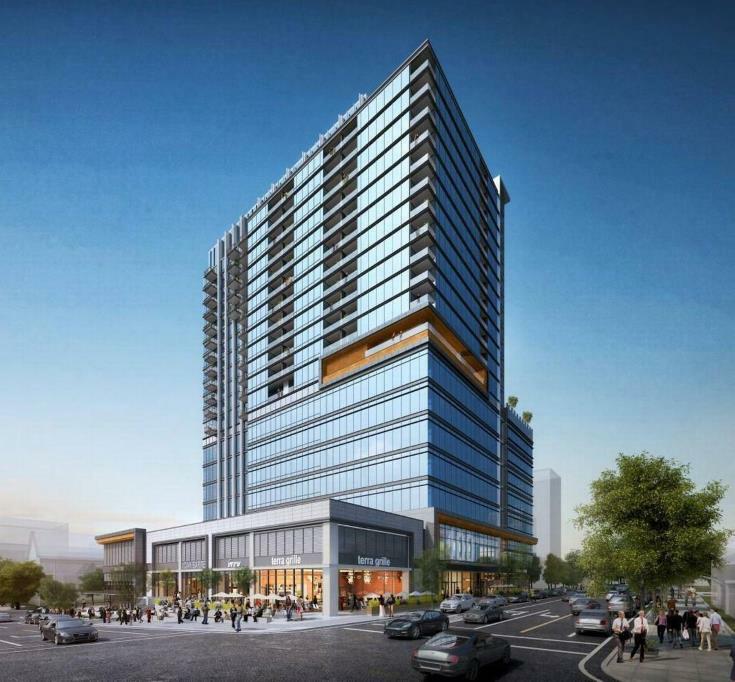 August 2017 was a planned move-in date about 6 months ago, according to the folks behind the project. The former Greyhound Bus Station on Jones Street has now been demolished. 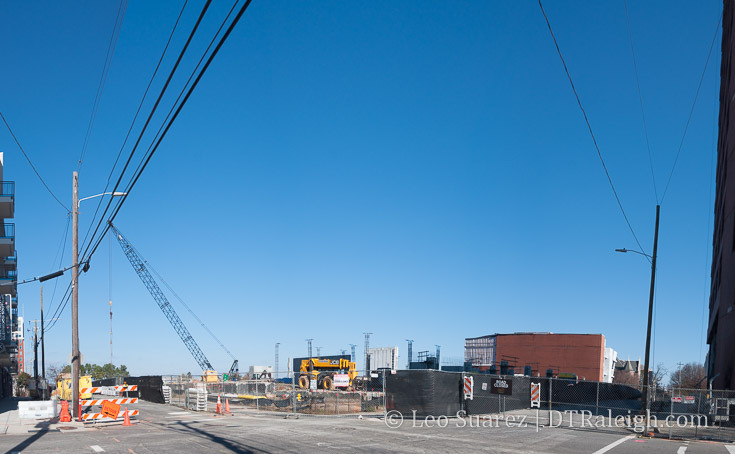 With the site cleared, construction of the Greyhound Apartments should begin. Personally, I hope they change the name but that’s just me. Imaps shows the property having a built date of 1971 so the Greyhound Station made it 45 years if that is what the data is referring to. The small warehouse next door, at the corner of Jones and Harrington, probably was around longer. Not demolished was the Levin-Tarlton House which rolled through downtown this February to its new home on New Bern Avenue. 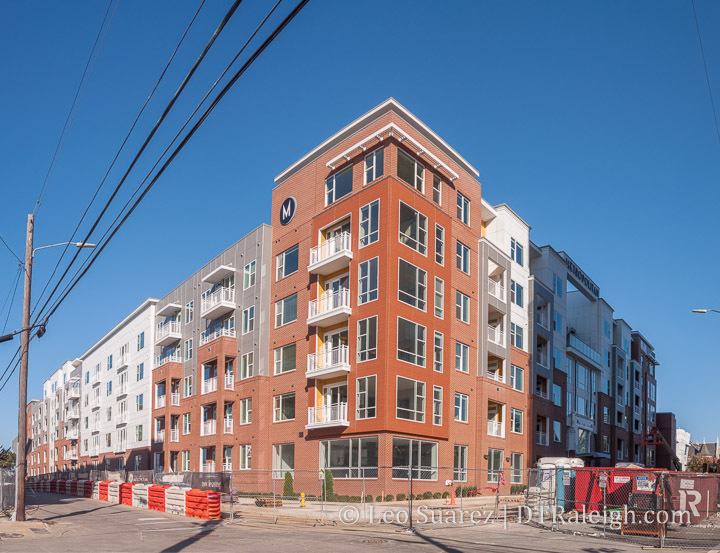 The new apartment building should go from Jones to Lane Street. I expect a similar configuration as The Lincoln because the footprints are about the same and so is the developer. Last thought, looking at a map of the nearby area I can’t help but wonder if Lane could be extended to West Street? (or even Glenwood) A traditional street with sidewalks and travel lanes may not work but perhaps something nontraditional that is only for bicycles and pedestrians. Lane doesn’t end at the state government complex like other nearby streets but rather goes way east. Riding a bike or walking, in some way, to Glenwood Avenue would be fantastic down Lane.